Can't attend? Follow Fukuoka Now to know of future events! • Non-reserved seating: 108 theater seats. 42 extra folding chairs if needed. • Advance tickets only. Available online or at the Fukuoka Now office (weekdays 09:30~18:00) All sales final. No refunds. With an ever increasing movement of people between places in this transnational age, there is a growing number of mixed-race people in Japan, some visible others not. According to the Japanese Ministry of Health, Labor and Welfare, one in forty-nine babies born in Japan today are born into families with one non-Japanese parent. This newly emerging minority in Japan is under-documented and under-explored in both literature and media. 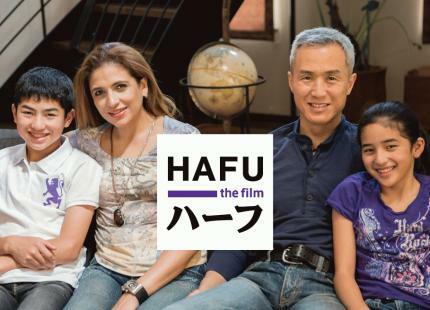 The feature-length HD documentary ﬁlm, “Hafu – the mixed-race experience in Japan” seeks to open this increasingly important dialogue. The ﬁlm explores race, diversity, multiculturalism, nationality, and identity within the mixed-race community of Japan. The film follows the lives of five “hafus”–the Japanese term for people who are half-Japanese–as they explore what it means to be multiracial and multicultural in a nation that once proudly proclaimed itself as the mono-ethnic nation. For some of these hafus Japan is the only home they know, for some living in Japan is an entirely new experience, and others are caught somewhere between two different worlds. Narrated by the hafus themselves, along with candid interviews and cinéma vérité footage, the viewer is guided through a myriad of hafu experiences that are influenced by upbringing, family relationships, education, and even physical appearance. As the film interweaves five unique life stories, audiences discover the depth and diversity of hafu personal identities. What does it mean to be hafu? ; What does it mean to be Japanese? ; and ultimately, What does all of this mean for Japan? Don’t miss this one-time special screening in Fukuoka!